For other uses, see Leather (disambiguation). "Deerskin" redirects here. For the novel by Robin McKinley, see Deerskin (novel). Leather can be oiled to improve its water resistance. This currying process after tanning supplements the natural oils remaining in the leather itself, which can be washed out through repeated exposure to water. Frequent oiling of leather, with mink oil, neatsfoot oil, or a similar material keeps it supple and improves its lifespan dramatically. 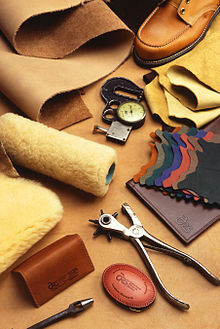 Vegetable-tanned leather is tanned using tannins extracted from vegetable matter, such as tree bark prepared in bark mills. It is the oldest known method. It is supple and brown in color, with the exact shade depending on the mix of materials and the color of the skin. The color tan derives its name from the appearance of undyed vegetable-tanned leather. Vegetable-tanned leather is not stable in water; it tends to discolor, and if left to soak and then dry, it shrinks and becomes harder. This is a feature of oak-bark-tanned leather that is exploited in traditional shoemaking. In hot water, it shrinks drastically and partly congeals, becoming rigid and eventually brittle. Boiled leather is an example of this, where the leather has been hardened by being immersed in hot water, or in boiled wax or similar substances. Historically, it was occasionally used as armor after hardening, and it has also been used for book binding. Chrome-tanned leather, invented in 1858, is tanned using chromium sulfate and other chromium salts . It is also known as "wet blue" for the pale blue color of the undyed leather. The chrome tanning method usually takes approximately one day to complete, making it best suited for large-scale industrial use. This is the most common method in modern use. It is more supple and pliable than vegetable-tanned leather and does not discolor or lose shape as drastically in water as vegetable-tanned. However, there are environmental concerns with this tanning method, as chromium is a heavy metal. Chamois leather is a form of aldehyde tanning that produces a porous and highly water-absorbent leather. Chamois leather is made using marine oils (traditionally cod oil) that oxidize to produce the aldehydes that tan the leather. Full-grain leather contains the entire grain layer, without any removal of the surface. Rather than wearing out, it develops a patina during its useful lifetime. It is usually considered the highest quality leather. Furniture and footwear are often made from full-grain leather. Full-grain leather is typically finished with a soluble aniline dye. Russia leather is a form of full-grain leather. Bicast leather is split leather that has a polyurethane or vinyl layer applied to the surface and embossed to give it the appearance of a grain. It is slightly stiffer than top-grain leather but has a more consistent texture. Patent leather is leather that has been given a high-gloss finish by the addition of a coating. Dating to the late 1700s, it became widely popular after inventor Seth Boyden developed the first mass-production process, using a linseed oil-based lacquer, in Newark, New Jersey, in 1818. Modern versions are usually a form of bicast leather. Bonded leather, also called reconstituted leather, is a material that uses leather scraps that are shredded and bonded together with polyurethane or latex onto a fiber mesh. The amount of leather fibers in the mix varies from 10% to 90%, affecting the properties of the product. Horse hides are used to make particularly durable leathers. Shell cordovan is a horse leather made not from the outer skin but an under layer found only in equine species called the shell. It is prized for its mirror-like finish and anti-creasing properties. Kangaroo leather is used to make items that must be strong and flexible. It is the material most commonly used in bullwhips. Some motorcyclists favor kangaroo leather for motorcycle leathers because of its light weight and abrasion resistance. Kangaroo leather is also used for falconry jesses, soccer footwear, and boxing speed bags. Although originally raised for their feathers in the 19th century, ostriches are now more popular for both meat and leather. 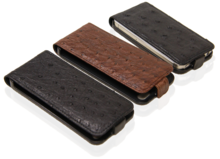 Ostrich leather has a characteristic "goose bump" look because of the large follicles where the feathers grew. Different processes produce different finishes for many applications, including upholstery, footwear, automotive products, accessories, and clothing. One estimate of the carbon footprint of leather goods is 0.51 kg of CO2 equivalent per £1 of output at 2010 retail prices, or 0.71 kg CO2eq per £1 of output at 2010 industry prices. Tanning is especially polluting in countries where environmental regulations are lax, such as in India, the world's third-largest producer and exporter of leather. To give an example of an efficient pollution prevention system, chromium loads per produced tonne are generally abated from 8 kg to 1.5 kg. VOC emissions are typically reduced from 30 kg/t to 2 kg/t in a properly managed facility. A review of the total pollution load decrease achievable according to the United Nations Industrial Development Organization posts precise data on the abatement achievable through industrially proven low-waste advanced methods, while noting, "even though the chrome pollution load can be decreased by 94% on introducing advanced technologies, the minimum residual load 0.15 kg/t raw hide can still cause difficulties when using landfills and composting sludge from wastewater treatment on account of the regulations currently in force in some countries." The higher cost associated with the treatment of effluents than to untreated effluent discharging leads to illegal dumping to save on costs. For instance, in Croatia in 2001, proper pollution abatement cost US$70–100 per ton of raw hides processed against $43/t for irresponsible behavior. In November 2009, one of Uganda's main leather making companies was caught directly dumping waste water into a wetland adjacent to Lake Victoria. The natural fibers of leather break down with the passage of time. Acidic leathers are particularly vulnerable to red rot, which causes powdering of the surface and a change in consistency. Damage from red rot is aggravated by high temperatures and relative humidities. Although it is chemically irreversible, treatments can add handling strength and prevent disintegration of red rotted leather. Various treatments are available such as conditioners. Saddle soap is used for cleaning, conditioning, and softening leather. Leather shoes are widely conditioned with shoe polish. Due to its excellent resistance to abrasion and wind, leather found a use in rugged occupations. The enduring image of a cowboy in leather chaps gave way to the leather-jacketed and leather-helmeted aviator. When motorcycles were invented, some riders took to wearing heavy leather jackets to protect from road rash and wind blast; some also wear chaps or full leather pants to protect the lower body. Leather's flexibility allows it to be formed and shaped into balls and protective gear. Subsequently, many sports use equipment made from leather, such as baseball gloves and the ball used in American football. Many rock groups (particularly heavy metal and punk groups in the 1980s) are well known for wearing leather clothing. Extreme metal bands (especially black metal bands) and Goth rock groups have extensive black leather clothing. Leather has become less common in the punk community over the last three decades, as there is opposition to the use of leather from punks who support animal rights. Judaism forbids the comfort of wearing leather shoes on Yom Kippur, Tisha B'Av, and during mourning. Also, see Teffilin and Torah Scroll. Many artificial leather substitutes have been developed, usually involving polyurethane or vinyl coatings applied to a cloth backing. Many names and brands for such artificial leathers exist, including "pleather", a portmanteau of "plastic leather", and the brand name Naugahyde. Another alternative is cultured leather which is lab-grown using cell culture methods. A few companies have started to produce cultured leather commercially. ^ NIIR Board of Consultants (2011). Leather Processing & Tanning Technology Handbook. NIIR Project Consultancy Services. p. 323. ISBN 9788190568593. ^ Binggeli, Corky (2013). Materials for Interior Environments. John Wiley & Sons. p. 119. ISBN 9781118421604. ^ "What type of Leather do I have?". Soccer Cleats 101. Retrieved 27 July 2010. ^ "Speed Bag Parts". Speed Bag Central. Retrieved 7 February 2018. ^ "Pollution Prevention and Abatement Handbook - Environmental Guidelines for Tanning and Leather Finishing" (PDF). Multilateral Investment Guarantee Agency, World Bank Group. Retrieved 2 January 2010. ^ "Interesting Facts about Leather". CalTrend. Retrieved 7 February 2018. ^ "Why Doesn't Plastic Biodegrade?". LIVESCIENCE. 2 March 2011. Retrieved 7 February 2018. ^ "The scope for decreasing pollution load in leather processing" (PDF). United Nations Industrial Development Organization Regional Programme for Pollution Control in the Tanning Industry in South-East Asia. 9 August 2000. Retrieved 2 January 2010. ^ "How much time needed to check tanneries' waste". Times of India. 11 July 2009. Archived from the original on 5 December 2010. Retrieved 2 January 2010. ^ "Kanpur: chromium disaster". Clean Ganga - Campaign for a cleaner Ganga. June 2003. Archived from the original on 22 August 2003. Retrieved 2 January 2010. ^ "Hazaribagh neighborhood of Dhaka poisoning staff, local villagers and planet". Human Rights Watch. 8 October 2012. Archived from the original on 28 March 2017. Retrieved 19 November 2016. ^ "Bangladesh cuts power to leather district after years of environmental violations". PBS NewsHour. Archived from the original on 12 April 2017. Retrieved 11 April 2017. ^ "Introduction of Low Pollution Processes in Leather Production" (PDF). EcoLinks. 2001. Archived from the original (PDF) on 19 January 2010. Retrieved 2 January 2010. ^ "Uganda: leather factory faces closure over pollution". The Monitor. 5 November 2009. Archived from the original on 4 June 2011. Retrieved 2 January 2010. ^ "Maintain Lather Bag". larocco. Archived from the original on 3 June 2016. Retrieved 4 May 2016. ^ "Wearing Shoes - Mourning Observances of Shiva and Sheloshim". Chabad.org. Archived from the original on 22 December 2009. Retrieved 20 October 2009. ^ "Artificial Leather- An Eco-friendly Alternative Textile Material for leather" (PDF). 2011. Archived from the original on 16 October 2015. ^ "Would you wear leather that's grown in a lab?". CNN. 4 October 2018. Retrieved 23 March 2019. ^ "The Future of Leather Is Growing in a New Jersey Lab--No Animals Needed". [[Inc. (magazine)|]]. April 2018. Retrieved 23 March 2019. Beeby, K.J. The Wonderful Story of Leather (PDF). UK: Harmatan. Lefroy, George Alfred (1884). The leather-workers of Daryaganj . Delhi: Cambridge Mission to Delhi. Leathers for Bookbinding and Upholstery (PDF). UK: Harmatan. 2002. Leather for Libraries (PDF). UK: Harmatan.